Orpheum are pleased to be supporting two exceptional female-fronted gothic metal bands at The Peel in Kingston, SW London on 11th June 2012. Tickets are £7 on the door. We are delighted to let you know that we shall be played on Church’s Crypt radio show tomorrow night, so head over to their Facebook page (link), check it out and tune in tomorrow night at 8pm! 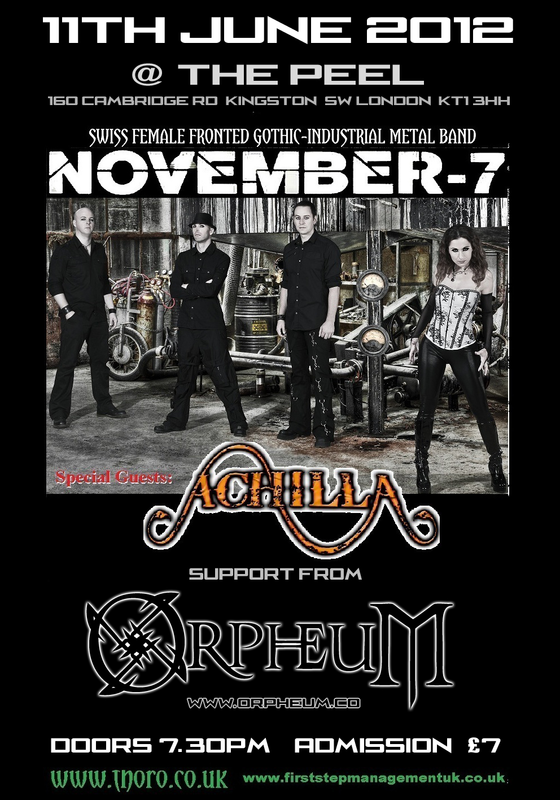 We are very pleased to announce that Orpheum shall be supporting the Swiss gothic metal band November-7 on their 2012 UK tour! We shall be playing at The Boston Music Room in Tufnell Park, London on 11th June, doors at 8pm. Also performing are the awesome prog metal band Achilla, setting up a great night of female fronted metal!